On Wednesday, when Facebook announced its acquisition of messaging service WhatsApp for $16 billion, some wondered why Facebook would spend so much on a service it already has through its successful Messenger app — which, according to analyst Benedict Evans, has 56 million users as of last year — but a close look at Facebook’s strategy and limitations with mobile helps show how WhatsApp can not only continue to operate alongside Facebook, but also help propel the social media giant to new heights. Facebook CEO Mark Zuckerberg spent a fair amount of time on the company’s acquisition call Wednesday and in a blog post simply explaining how WhatsApp’s features differ from what Messenger already brings to the table aside from 450 million users. But I’d argue that the distinction isn’t so much about what WhatsApp can do — it’s about how and where it does it. The key to WhatsApp’s success in these markets, as Zuckerberg noted in the acquisition call, is that it’s a light, flexible messenger that doesn’t gobble data through pushing ads. It also works well with popular Nokia feature phones that still sell well in India, despite the boom of smartphone sales. For users just entering the mobile world (or still struggling to cope with the price and speed of global mobile connectivity), WhatsApp isn’t just an app but a service that lets users connect with others — a fact that is reflected in the billions of messages sent through WhatsApp each day. Capitalizing on WhatsApp’s dominance in emerging markets could help Facebook scale in countries where it has been lagging. 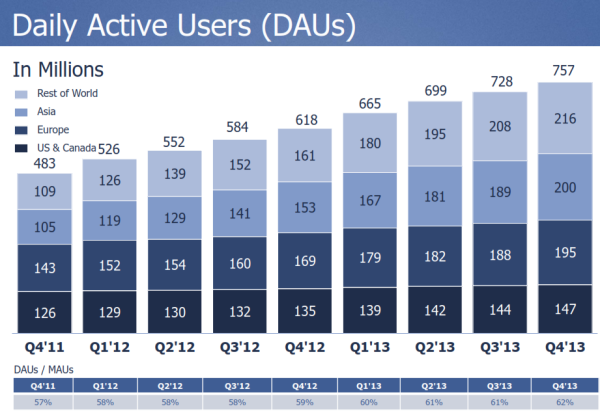 For example, India is likely to hit 150 million Facebook users this year, surpassing the U.S. user base. Under Facebook’s umbrella, WhatsApp could further accelerate that growth, thanks to its existing popularity and significant carrier contracts with TaTa DoCoMo and Reliance Communications. WhatsApp can penetrate growing markets faster than Facebook can, and scale more quickly. This scenario could end in Facebook becoming the dominant way that international users communicate with each other, eclipsing SMS and driving down carrier costs. There are no guarantees that Facebook’s partnership with WhatsApp will be smooth. In many markets, Facebook has been operating as a competitor to WhatsApp for the last few years. Products like Facebook For Every Phone feature chat prominently, and users with computers can also access SMS messaging from Facebook directly. It will be up to Facebook to decide whether and when to integrate WhatsApp into its messaging capabilities. 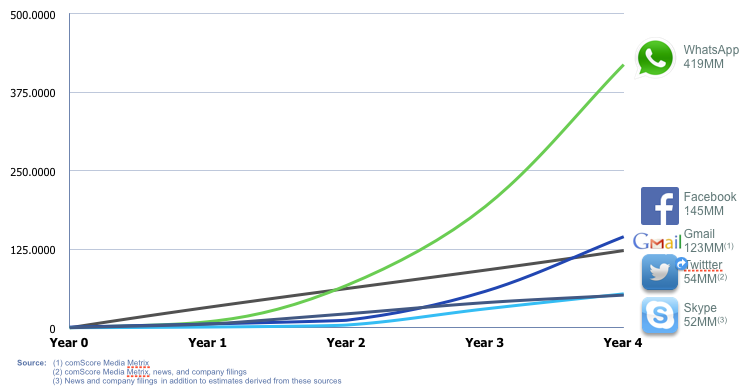 Chart showing social media companies growth. Courtesy of Facebook. If the services are eventually merged, Facebook will have to do so in a way that doesn’t sacrifice the reasons why users choose WhatsApp in the first place — specifically, WhatsApp’s streamlined data usage, lack of ads, and simple interface. Facebook should take care to protect users’ loyalty to WhatsApp, and while it says that WhatsApp will remain separate, should that change it should move slowly slowly to keep users from jumping ship. Some have argued that the WhatsApp acquisition will allow Facebook to enter China, where the social media site has been blocked since 2009. WhatsApp has a presence in the country, despite the fact that Tencent’s WeChat holds a 93 percent market share, which makes it a small but important foothold. But the Chinese government may simply block WhatsApp too, now that it’s owned by Facebook. Meanwhile, privacy regulators are already encouraging WhatsApp users to leave the service, citing Facebook’s cooperation with the NSA and loose U.S. data protection laws. WhatsApp has built a reputation on protecting user information and respecting privacy, and Facebook’s acquisition of the company could put that in jeopardy and stunt overall growth and adoption rates. Zuckerberg made it clear on Wednesday’s investment call that he wants WhatsApp to spend the next few years doing what it has already managed to do very well: grow. With steady (if relatively insignificant) revenue coming in from a universal subscription plan and a lean team, WhatsApp will cost Facebook nearly nothing to maintain and create an avenue for the company to reach new users. Over time, as Facebook works to connect the world through Internet.org, the company will have an opportunity to roll WhatsApp into a Facebook data experience for all markets, encompassing social media, messaging, real-time chat, SMS and VoIP — essentially a communication toolkit at any mobile user’s fingertips. Google was called out for buying Motorola with all it’s stash of patents and assets for $12.5 billions. According to some Wall Street analysts, that acquisition amount dwindle down to $3-$4 billions after Google sold off Motorola mobility unit to Lenovo, of course, through some taxation dojo. And keeping all the patents. Time will tell, if this translate into anything for Zuckerberg, but an app for $19 billions?.